The past few years have not been that great for me. With each year I’ve noticed my health getting worse (fibromyalgia). Every year I have always made up a list of goals for the next year and never get far because I never feel well. At the end of the year, any goals that I didn’t get to just get added to the next years list with my new goals. Only, I am getting to the point where I can’t do much at all. So this year I didn’t make any “new year goals.” I just decided to do as much as I can, when I can. Every day is a new day and whatever it brings I will just have to roll with it. If I can’t get out of bed than that is all I can do. I did start a few year long endeavors but nothing that will throw me off if I miss a day. Temperature Scarf. My oldest son Jared helped me with this a lot. He went with me to Joann’s and helped me pick out 12 colors (including black). Then we arranged them into a pleasing rainbow of sorts with the colors we deemed to be “cold colors” on one end and the “hot colors” on the other end. Jared made my chart for me with a temperature range for each color. I decided I wanted to show the extremes in temperature we get here so I divided the year into thirds. The first 4 months I am checking the temperature each day and taking the low for the day I check my chart to find out what color to use. I work one row a day based on the temperature. After the first 4 months I’ll switch to the high temperature then back to the low temps for the last four – so it will be warm around my neck (where the middle is hehe) I am almost finished with January and I love how it looks already! After the last day of January I’ll add a few rows of black. I started with a few rows of black and I’ll end with a few rows of black and when it is all done I’ll add an edge of black. That way it will look like a thermometer kinda. 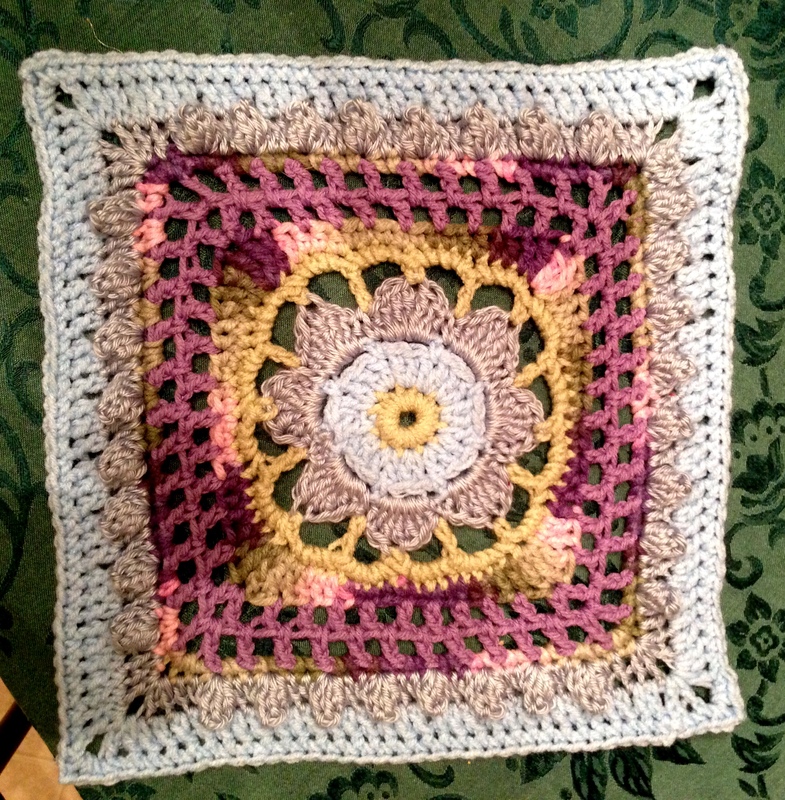 I joined a CAL (crochet a long) on ravelry.com that is making a 12″ x 12″ block every month. They also vote for an extra 12″ square and there is also a 6″ square each month for people wanting to make a baby blanket or whatever. 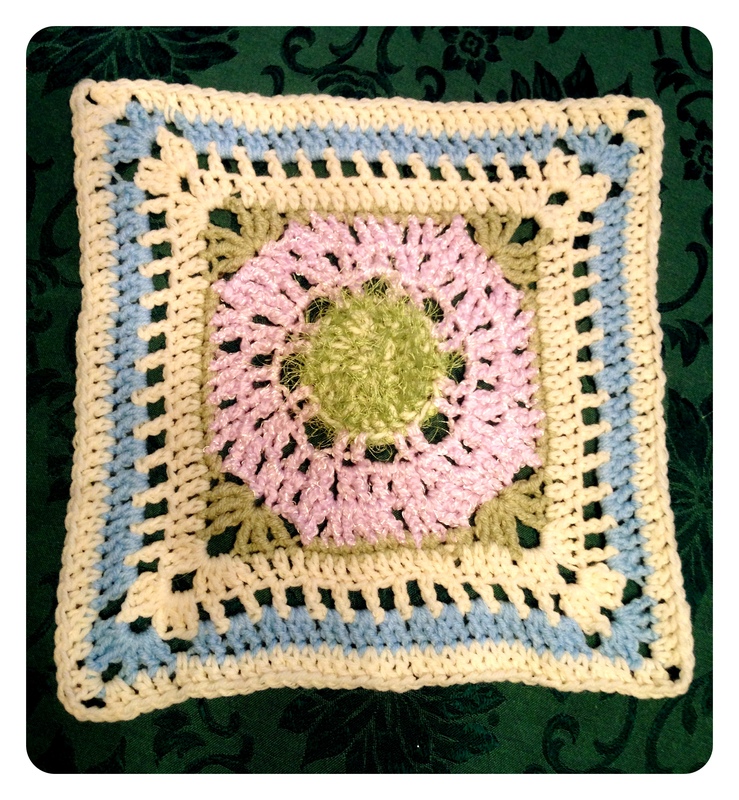 I joined another CAL (Official CCC Social group) that is doing a 12″ x 12″ block every WEEK! (until Nov I think which leaves time to piece them together) The last two pictures show the first two from this group. They are so awesome!!! 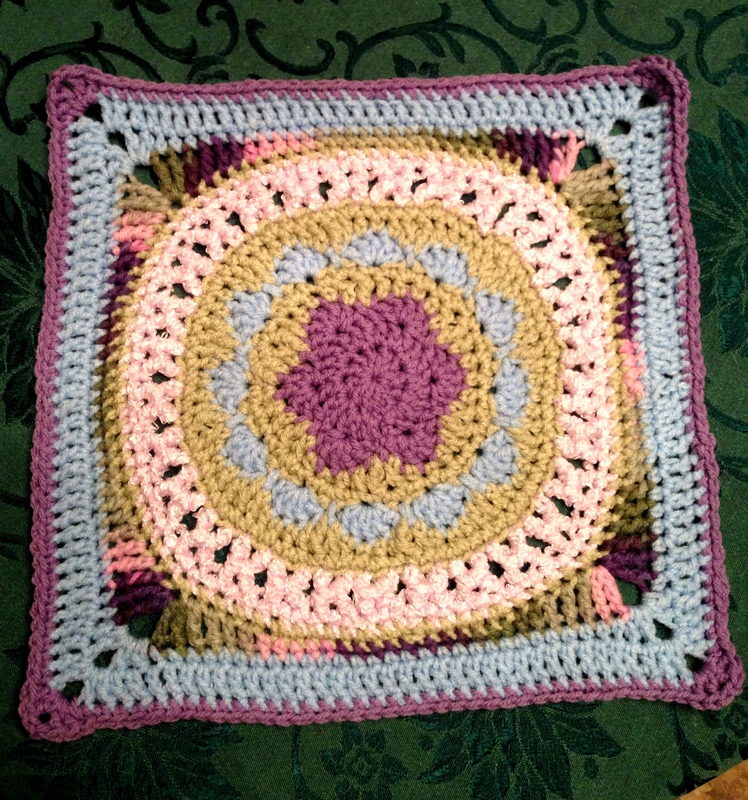 I also joined another crochet group that has several different CAL’s planned throughout the year. Creative Crochet Crew Group has to be the best crochet group I’ve seen on facebook. Their first project is starting on Feb 4th I believe and they are making the Magnificent Moss Basket. They even have the designer in this group in case anyone has any questions. This group is totally focused on crochet so no random chit chat about other things or negativity of any sort. No knitting or other off topic things either. That makes it really nice because it is such a large group. I find so many wonderful patterns or ideas in this group. The group I linked in #3 above is the social group where chit chat is allowed but not the negativity. Both groups are awesome! This link is to my Ravelry Project page for my 2014 blanket! I’ll be adding each square as I do them so if you check back you can see all the patterns (which are all free). When I finished the purple flower with the green part it made me think of a water lily so I made the rest blue. So all of these “endeavors” are crochet related. That seems to be the one thing that keeps me going. Last year I was really into knitting but lately I only want to crochet. I’ve been crocheting for most of my life (my sister started teaching me when I was 5) but I haven’t been knitting all that long. When I am in pain and have a hard time focusing I go for the thing that I can do on autopilot. It helps to keep my mind focused on something – something not to hard but hard enough to keep my mind off of hurting. This may sound silly but if I am in so much pain that I can’t crochet, I actually try to mentally form the stitches in my head as a way to distract myself. I think everyone with fibromyalgia has their little tricks like that. Oh, I should add, I am doing all of these things using only yarn that I already have. I have a lot! I picked out four colors to make a blanket for my room. Purple – Green – Blue – Cream But, I am using different yarns and different shades of those colors in my squares. I may even make some 6″ squares and group 4 together into a larger square. I got the bright idea to use green fun fur with the white for the center of this square. Then I had to give it a haircut because it looked like an overgrown lawn! 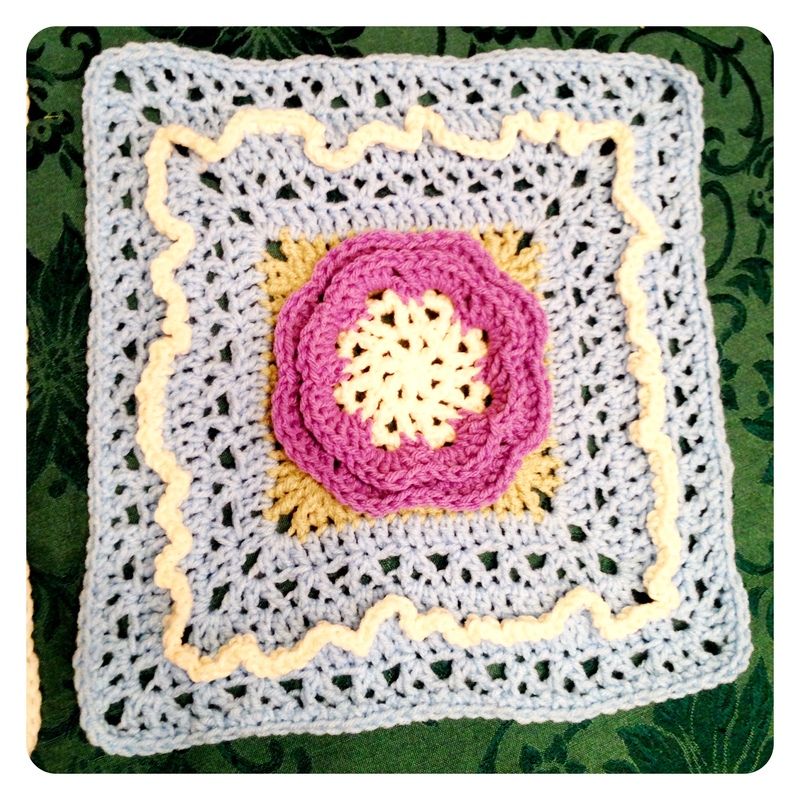 Making a blanket to fit my bed might be overwhelming but making a 12″ square can be done in an hour or so. When I don’t feel well it takes me all day but I still find myself waiting impatiently for the next one to be posted in each group. In no time at all I will have enough squares to make my blanket and I really doubt it will take a year. I’ll probably make a blanket for every bed in the house. The flower in this one is two shades of blue but the darker shade looks gray in the picture. There actually isn’t any gray in this. Awesome stuff, Donna. I wish I knew how to crochet. Oh hey, I’m coming up in June. Want to meet for pancakes? They look beautiful. One square in a hour, I would be lucky to have a 3 inch circle in that timeframe. I’m glad you found something to help with the pain.